I adore this MIT project, which aims to make spending easier—or harder. Affixed with a Bluetooth module, the wallet connects to a cellphone and the user's online banking, so it expands when rich and deflates when poor. That's just one of the designs, the Peacock, but there are two others which are equally innovative. The Bumblebee buzzes and vibrates every time a transaction is made, with the pricier the purchase, the longer the buzz. Mother Bear is most likely the most frustrating for big spenders. It's got a hinge inside, which clamps the wallet shut when the person has gone over budget (it can be programmed with the month's budget maximum). 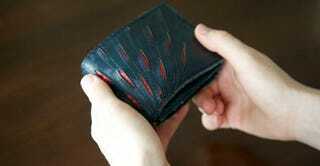 As that maximum approaches, the wallet becomes harder to open—you could say the user is a tight wallet.